Yes, friends... it's once again Sneak Some Zucchini onto Your Neighbors' Porch Day (or Night — your preference), one of those obscure and frivolous holidays we rootless Americans create out of festive necessity. That said, I think the concept is solid. The zucchini (or courgette, for you Europeans) tends to hit a point of outrageous surplus right about now. Once you've already sautéed, puréed, broiled, grilled, fried and stuffed them, there's a risk of becoming bored with zucchini. Since it may be difficult to offload a stack of squash on a bewildered random citizen, "gifting" the neighbors seems like great fun. A suggestion for would-be squash sneakers? Slip a quality recipe into that bag or basket. In addition to the savory stuff, like ratatouilles, stews, tagines and summer succotashes, zucchinis tend to play well in sweets. Zucchini bread is a popular choice, but why not try Zucchini Blondies? I use a variation on the recipe in Victoria Wise's Gardeners' Community Cookbook, and it's proved to be popular at my office bake sale. 1. Preheat the oven to 350°F. Grease the bottom of a 9" square baking pan. 2. Mix the butter, brown sugar, egg and vanilla in a large mixing bowl, and beat together until blended. 3. Sift the flour, baking powder, baking soda and salt into the same bowl and stir to blend. Incorporate the zucchini and nuts. The blend should be thick. 4. Spread the batter across the baking pan, and sprinkle the chips over the top. 5. Bake for 30 minutes, or until a knife inserted in the center comes out clean. 6. Remove, cool and slice into squares. They'll keep for about 3 days at room temperature, or wrap individually and freeze for future snacking. But if, like me, you lack both garden and porch (alas! ), you can always soothe your great green envy with a kitchy needlecraft kit like this one, uncovered on a recent web foray. Those crazy crafters! No stone unturned. 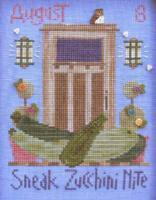 No zucchini unstitched. However you choose to celebrate, I wish you a very happy SSZoYNP Day, and many tasty returns.